Many people who contribute to ‘Unexamined Lives’ do so because they want to re-visit past relationships and family experiences in order to make sense of them. 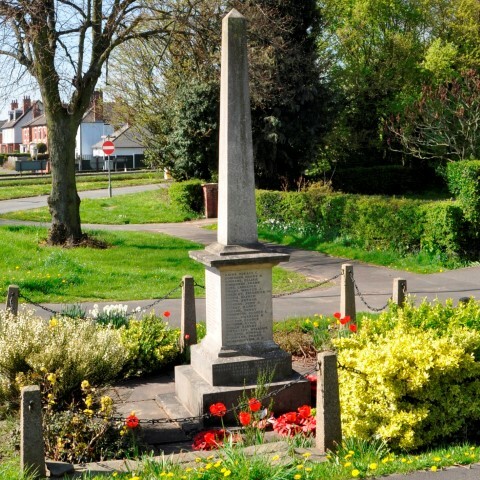 For Ruth Simpson, however (who was born in Carlisle but moved to Borrowash with her family as a small child) it is the village itself that matters. In over three hours of taped conversation with project interviewers Paul Hart and Anthony Heron, Ruth does not mention the Christian names of her grandparents, husband, and children; we are not told how she met and married her husband or what he did for a living. 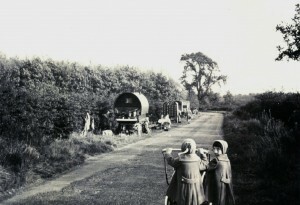 It is the physical Borrowash of her childhood that she evokes in an extraordinarily detailed verbal mapping of a village with its shops, new and old houses, a primary school erected on the site of a former pig farm and gypsy caravans in the aptly named ‘Gypsy Lane’. Ruth talks about the ‘unexamined life’ of a village in the years after World War Two and sees the human characters as pinpricks – important because of their relation to the geography rather than their interaction with those they loved, hated, pitied or befriended – a record of ‘activity’ in a setting – not a journey into the mind or a searching of the soul. 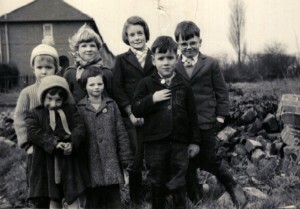 The adult Ruth would return to Gretna and Kirkpatrick Fleming, taking her children to visit their Great Aunty Kathy, but there is no sense of nostalgia in her brief references to the haunts of her earliest days. 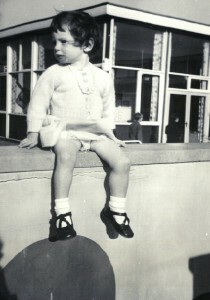 Before her third birthday, Walt was made redundant from the Gretna power station and took a job at its counterpart in Spondon near Derby. 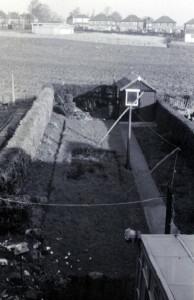 Ruth does not say why the decision was made to uproot the family and move so far away; maybe it was to pacify Edna who still had relatives in Derby – or it could have been because there were no local jobs to be found. Whatever the reason, family life was interrupted because Walt initially moved on his own to keep in work, and lived in lodgings whilst house-hunting. After a short period at the power station, he started a new job as an electrician on the railway and remained there until taking early retirement in 1981. 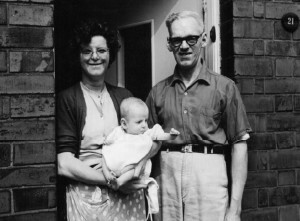 Six months after he had left Kirkpatrick Fleming, Walt Wildey introduced wife Edna, twins Ruth and Suzy and the baby, Hazel , to their new home; 21 Kimberley Road in Borrowash, Derbyshire. One end of the street seemed to be populated by older people and anyone who was different was noticed. Ruth does not comment on whether or not the newcomers living in the former Vestey house integrated themselves with the locals but as World War Two had ended less than twenty years ago, ‘the German Tribbensee family’ would have certainly stood out from the crowd. 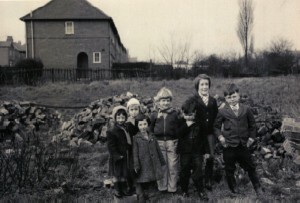 As she looks at the village today, Ruth maps the Borrowash of her childhood. 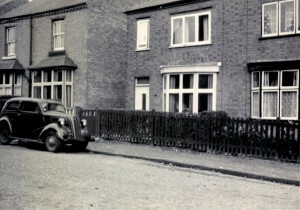 The familiar chip shop on Victoria Avenue was once owned by a greengrocer called Rogers, a furniture shop and a Samuel’s shoe shop were prominent outlets ‘on the main road’ and today’s bridal shop, travel agent and estate agent near to Victoria Avenue were respectively a chemist, a bank and a bakery. The Rajni Indian restaurant was once Simm’s sweet shop, popular with children – but the hardware shop remains in situ, now as then. The advantage of knowing everybody in the street meant that you also knew who had a telephone when one was needed in an emergency. Daytime screening was yet to come, so watching the television was a night time treat, consisting of specific children’s programmes ( ‘Rag, Tag and Bobtail’, ‘Andy Pandy’, ‘Wooden Tops’) and the new adult ‘soaps’ ( ‘Coronation Street’ had started, and ‘Crossroads’). It was also the era of the western, represented by John Wayne. Walt worked night shifts for the whole of his life and sometimes Edna was involved with Methodist church activities in the evening so it was only possible to do things together as a family at weekends. Favourite choices were going camping in Derbyshire in the summer and visiting the swimming baths at Bramcote in the winter. It scarcely mattered because ‘we used to have fun’. Many of the people she cleans for are elderly and without family (‘amazing that there are people in their 70s, 80s and 90s who have got no family living round them’) and Ruth, who grew up in an era when everybody knew everybody else’s business, played in each other’s gardens, helped to carry an old person’s shopping and thought nothing of it when a neighbour arrived at midnight to use the telephone in an emergency, has brought something of an earlier community spirit into her work today. 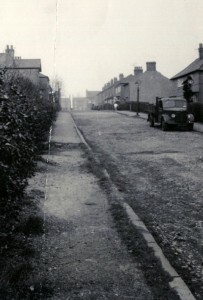 In the Borrowash of Ruth Wildey’s childhood, life was lived at a slower pace and in the absence of fast cars, the latest gadgets, the biggest houses and all the trappings of the consumer society; people made more time for people. In 21st century Borrowash when for one reason or another ‘a lot of people have got nobody’ there is at least one cleaner who believes that ‘chatting to people’ is an important part of her job.